Happy Inauguration Day! Sweet Revenge has been open for little over a year now, but Brownie and I have only found one occasion each where we could stop by for a visit. Hers was back in July, mine was last week when I found out that Marlo Scott is bringing diversity to cupcakes, change I can believe in! 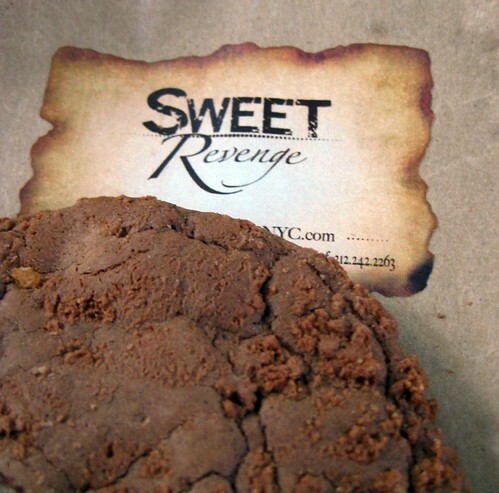 Sweet Revenge is different from many NYC cupcake places. 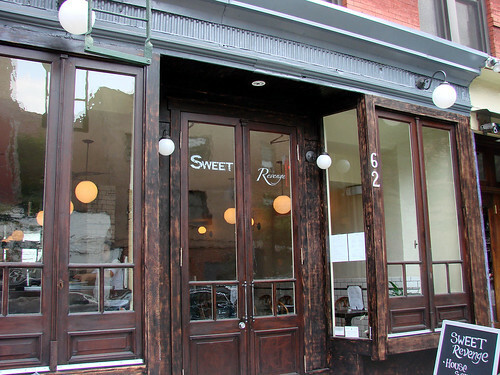 Where other big bakeries look retro or homey, Sweet Revenge is just the opposite, dimly lit and romantic. They also serve beer and wine, even having separate beer and wine pairing menus. The setup is a bit confusing, I walked in expecting to pick out my cupcake, pay for it and sit down. Instead, I walked in, examined the cupcakes picking out the ones I wanted, eat them, and then pay. A little more service then I'm used to, it is more like a cupcake eatery than a cupcake bakery. 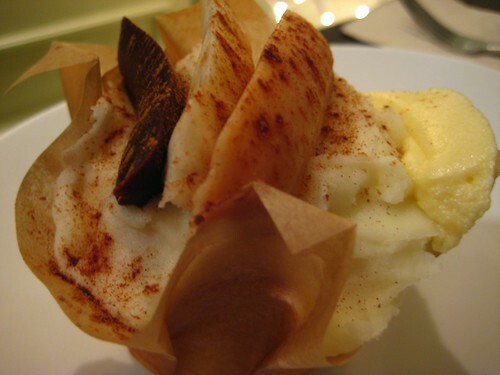 I first spotted the Pure Obama cupcake, a special for the inauguration. The Pure Obama cupcake consisted of the Mexican vanilla cake with mango, guava, candied ginger, dark chocolate truffle & vanilla buttercream. That's a lot of flavors and buttercream. I liked the tropical touches in the frosting, a nice change from the usual. I thought it may benefit from a ganache filling, as the cake was a bit on the dry side. The other cupcake I got was the namesake Sweet Revenge, peanut butter cake with a dark chocolate ganache filling and peanut frosting. I enjoyed this cupcake so much, I had to call Brownie half way through to get her thoughts. 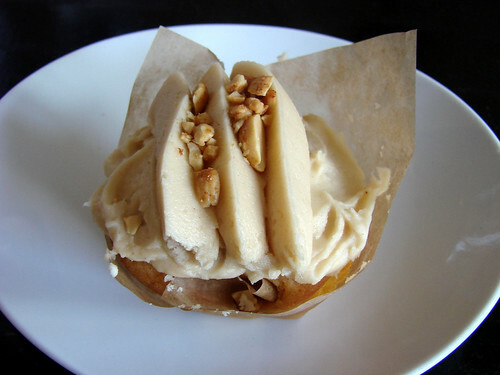 The frosting on this cupcake is in the running for favorite frosting in my book. The peanut taste is powerful, but not overwhelming, and it tastes like regular peanut butter, not pasty or funky. Add in the chocolate ganache filling, and black hearts were beating in my eyes. This isn't to say Brownie and I didn't see faults. She felt the cakes could be moister. My other problem is the frosting was very thick and heavy, and sometimes a little too much on the granular side for me. I also picked up a double chocolate chip cookie for later. When I got it, it held such promise with a slight give when I pressed down promising chewy insides. Yet, something happened. By the next morning it was hard and crunchy. I liked it, it is more bitter chocolate than sweet chocolate, but I wouldn't trek out of my way for another. BTW, Sweet Revenge and Butter Lane will be on tomorrow's Martha Stewart show (Brownie got to go, but I couldn't. It made me sad.) Check your local listings, cupcake lovers! We also have a plethora of Sweet Revenge photos between the two of us (mostly Brownie's,) so the best way to see them all is this slide show. Enjoy! that is a fancy looking upcake! and also the ones from the martha stewart show look unreal. they really do look like the face of a dog..